Jon de Mello at her Nuuanu home. THE afternoon breeze is cool in Nuuanu and the flowers are gorgeous. The home is old and beautifully maintained. The furnishings an exquisite blend of antiques and a few slightly more modern pieces. The ambience over all is of a distant and more gracious time steeped now in the mists of memory as composer Muriel Flanders and record producer Jon de Mello talk about her music. "It's been a remarkable experience working with an artist that takes such great pride in her songs and that each of her songs are part of her life. She's a perfectionist," de Mello is saying. "I'll never rest in my grave unless every word is perfect -- which is not always good," she says by way of explanation. "Up to the very recording she was still refining and shaping her lyrics, and I was really encouraging that," de Mello adds. "I think that songs and music and all forms of art are always in progress. Songs are life and we're all in progress." 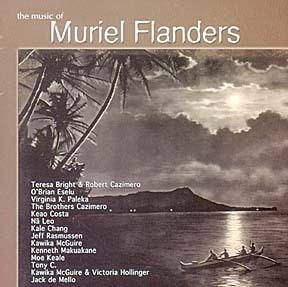 The songs in question are 15 Flanders compositions that de Mello selected to record and release on a unique album titled simply "The Music of Muriel Flanders." Only one of the songs has ever been recorded before -- and that was as part of a project produced by his father, Jack de Mello, years before. graces the songwriter's Nuuanu home. The younger de Mello has been a prominent figure in the Hawaii recording industry for the past quarter-century but this is the first time he's recorded a compilation album honoring the work of a single composer. It's a first for Flanders as well, even though she's 92 and has been writing songs for most of her life. One of her early compositions, "My Pa'akiki Wahine," was published in 1936. She's been writing for her own enjoyment ever since. Most of the songs that de Mello picked are tied in one way or another to the history of Flanders' family. 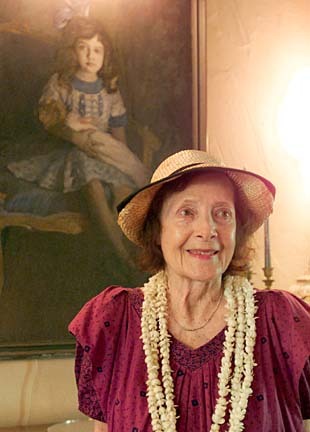 She's the daughter of the late Alice Kamokila Campbell and a granddaughter of James Campbell -- the legendary businessman and Hawaiian patriot who worked hard, invested wisely, and amassed a fortune. One of de Mello's choices was "Lanikihonua," which tells of a Campbell family compound on the sunny leeward coast. "Beautiful Le'ahi" tells of the beauty of Diamond Head, but since Flanders' grandparents had a home there too, the song contains some family kaona as well. Flanders wrote "Sunny Kapolei" when someone asked if she could come up with something to commemorate the 10th anniversary of the development. "I went to bed thinking, I woke up thinking, and I thought all day, and that night I was finished with it," she says of the song's genesis and birth. "There isn't a lot to say about Kapolei so I decided that sunshine is where Kapolei is strongest, and so it's "Sunny Kapolei" which might stick with (the area)." 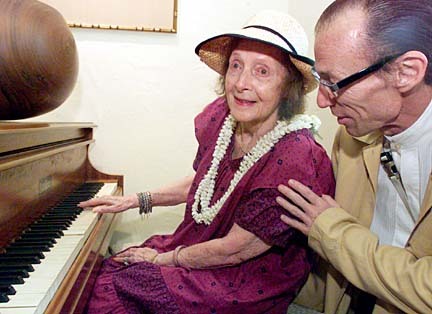 It might seem logical to assume that a composer her age would write traditional old-style hapa-haole songs. It's true there are people out there keeping that traditional alive but Flanders' isn't one of them. The diversity of subject matter, subtlety of her lyrics, and the stylings of the artists picked for the project, gives these songs more of a modern Hawaiian feel. She doesn't address such old-time topics as hula maidens and grass shacks either. Her perspective is that of a cultured and well-educated island resident. She says "Black Tears of Pearl Harbor," written to honor the men entombed aboard the USS Arizona and the other Pearl Harbor dead, is her favorite of the songs chosen for the album. "My Lanikai" is a close second. She wrote the song in celebration of her 50th wedding anniversary, and the lyrics are rich with kaona because they refer to the husband she adored and the unpredictable weather in the district where they made their home. She says this is one song that people shouldn't try to read too much into. "The phrase 'You are the passing squalls that hit and run' doesn't mean that he hit me," she explains, worried that the song might be misinterpreted. "The squalls come in very very fast (off the ocean). You're dry one minute and you're drenched the next and then you feel yourself all dry because the sun has dried you off. I wanted to capture that." Several other songs are equally complex. "The Royal Rain" commemorates the death and funeral of Queen Lili'uokalani in 1917. Flanders didn't take part in the funeral but paid her respects while the Queen was lying in state at Kawaiaha'o Church. The song can be interpreted as a beautiful requiem or as an oblique nationalist anthem. It is one of several songs that Flanders says is intended to simultaneously honor the past, recall what has been lost, and promote forgiveness and unity today. If there's a theme or message to be found in her album let that be it. Call: Linda Hearn, 623-2973; reservations due by July 16. Bold. Imaginative. A landmark album. "The Music of Muriel Flanders" is all that and more. It's 15 fresh and timeless songs interpreted by an assortment of similar but distinct modern Hawaiian entertainers. Not all the performer are equally prominent but they all do justice to the songs they're paired with. Each selection is a musical gem and a contemporary classic as well. For instance, there's Moe Keale adding his own recollections of Duke Kahanamoku to "From Steamer Lane to Shore." The song tells of Duke's bigger-than-life stature as a swimmer and surfer. What better way to embellish a song about a legend than by having it recorded by someone who knew him? Keale is the perfect choice. O'Brien Eselu sings "Sunny Kapolei" with a warmth that matches the sunny vistas Flanders celebrates in her lyrics. The smooth harmonies of Na Leo make "For You Pauahi" an enchanting tribute to both the school and the gracious princess. Simplicity is the key when Kawika McGuire sings "Black Tears of Pearl Harbor." Acoustic piano is all that's necessary to complete a perfect requiem. The stark contrast between melody and lyric image makes "The Royal Rain" haunting indeed. The melody is so beautiful that the song sounds almost cheery -- at least until the lyrics establish that the song commemorates the funeral of Queen Liliu'okalani who died "divested of her crown." A similar approach is used when Kenneth Makuakane sings of "The Floating Islands," a poetic but crystal clear description of the ships that brought Captain Cook to Hawaii in 1778. The lyrics tell of what was gained and what was lost in the aftermath of Cook's arrival. Once again, Flanders uses a deceptively soft and sweet melody to cushion her account of a pivotal and problematic moment in Hawaiian history. "City of Refuge" and "The Voice of Olomana" call on one and all to protect the 'aina and understand the poignancy of past tragedies, but to also seek the nobility of character necessary to accept and forgive, ideally without bitterness. There are some straight out fun songs here too. Kaeo Costa's frisky falsetto proves the perfect vehicle for sharing a fanciful tale of good old time in "The Old Lahaina Jail." The Brothers Cazimero, Teresa Bright, Kale Chang, Tony Conjugacion, Jeff Rasmussen, Victoria Hollinger, Virginia K. Paleka and Jack de Mello add their magic as well. The result is an album in which each song seems more beautiful than the other and yet none loses its appeal. What a magnificent tribute to a remarkable composer!